Its Wednesday once again. Welcome to another challenge at the Paper Craft Crew. This week we have a sketch challenge for you. 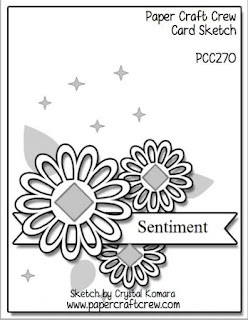 My card is a simple Black and White colour scheme, with a little Silver for some snowflakes. The stamp set used is called Hearts come Home for the Santa's Sleigh featured circle and the Merry Christmas greeting comes from the Merry Patterns stamp set. The embossing folder used on the background is a retired one called Northern Flurry. The framelits are the Layering Circle and the Seasonal Layers. Thanks so much for joining us this week at the Paper Craft Crew. Welcome to this week's challenge at Stamp, Ink, Paper. Coming up to Christmas is a great time to focus on packaging so thats what we have you for this week's challenge. I've decided to decorate an Acetate Box which is perfect for adding some handmade cards to for gift giving. This was actually really simple to decorate with a minimum of products. The patterned paper is from the Specialty pack Year of Cheer, to which I've added on top a Foil Snowflake and layered a greeting from the Merry Little Labels stamp set. Gold ribbon finishes it off. Thank you for joining us this week at Stamp Ink Paper! Can't wait to see your own packaging ideas. Thank you for joining us this week at the Paper Craft Crew. We have a themed challenge this week "Very Vintage" and I have to say my card is probably more on the Fresh Vintage side. What do you think? Anyway I can't wait to see what you create for this challenge. 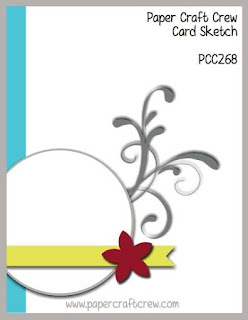 Here's my card using the Color Me Happy stamp set. I've used the Layered Leaves Embossing folder on the background and sponged it with a little Soft Suede ink. The Cardstock is Blushing Bride, Crumb Cake, Pool Party and Whisper White. I've also used our new Stampin Blends to colour in the birdies. Thanks so much for stopping by today. I hope you like my card and I hope you enjoy this weeks theme at the Paper Craft Crew. Have a great day. Its challenge time at Stamp, Ink, Paper. This week's theme is Thankful, Grateful, Blessed. We don't celebrate Thanksgiving like they do in the US so my card is a simple Thank You instead. Here's my card using stamps from the Color Me Happy stamp set coloured with our new Stampin Blends. The card front is what my ladies used for practice colouring with our first play of these new products. Thanks so much for stopping by today. We look forward to seeing your entry for this weeks challenge. Have a great day. 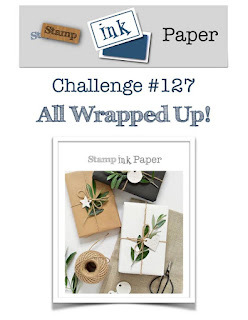 Welcome to this week's challenge at the Paper Craft Crew. Here's our sketch this week. I've decided to create my card using the Orchid Bundle. The background paper is from the Colour Theory Designer stack and the cardstock used is Thick Whisper white for the base, Old Olive, Sweet Sugarplum and Pear Pizzaz. Thanks so much for joining us this week. 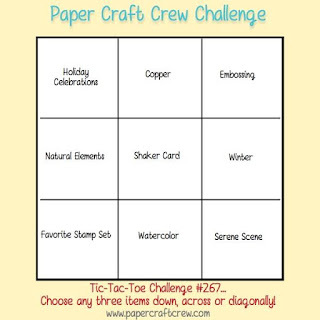 We hope you will play along with our sketch challenge at the Paper Craft Crew. Have a great day. 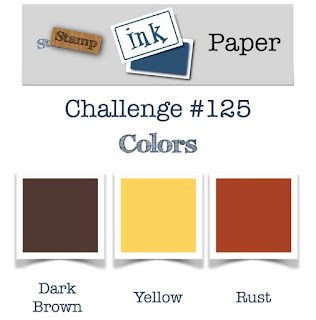 Welcome to this week's colour challenge at Stamp, Ink, Paper to use Dark Brown, Yellow, Rust/Orange. This is what I've come up with for the challenge. They aren't really colours I love but they did look manly to me so I decided to go masculine. I've featured the Happy Birthday thinlits for my card and used some retired dsp & cardstock also with some dsp from the Coffee Break. Thanks so much for joining us this week at Stamp, Ink, Paper. Can't wait to see your creation with these colours. Have a great day. Its Wednesday once again so its time for our challenge at the Paper Craft Crew. This time we have a Tic Tac Toe board for you to play along with. Choose any line you like, Vertical, Horizontal or Diagonal. We can't wait to see what you make. Here's my card using up some retired Winter Wonderland specialty dsp and retired embossing folder Pine Bough with a current stamp set which is a favourite at the moment called Snowflake Sentiments. The cardstock is Crumb Cake. I've used the first vertical row from the Tic Tac Toe Board "Holiday Celebrations, Natural Elements and Favourite stamp set". I'm quite pleased with how this turned out, being a very quick CAS card. Here's a closeup. Looking forward to seeing your creation in the gallery this week at the Paper Craft Crew. Thanks so much for joining us and have a great day. 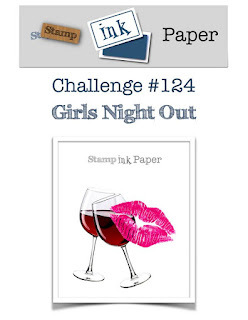 Welcome to our themed challenge this week at Stamp, Ink, Paper. So I've changed mine slightly to Ladies Day at the Races, in honour of our Melbourne Cup race today here in Australia. This is my card. I've made an Easel card and used Beautiful You and Mixed Drinks stamp sets for the images. I've also used the Layering Oval framelits. The Cardstock I've used is Watermelon Wonder, Blushing Bride and Whisper White. The patterned paper is from the Birthday Bouquet (retired) designer paper pack. This is the side view of the card to show how the Easel sits and the pic below is a closer look at the card front. I've used our new Alcohol markers called Stampin' Blends to colour the images. This is a closeup of the bottom panel greeting. I've used the set Colour me Happy set for the greeting. So glad you could join us today. We do hope you will create a card and join us in the challenge this week too. Have a great day.